This Breville Cutting Board is designed to fit onto the Breville Compact Smart Oven for convenient storage - and can be used as a trivet, cutting board or serving tray. 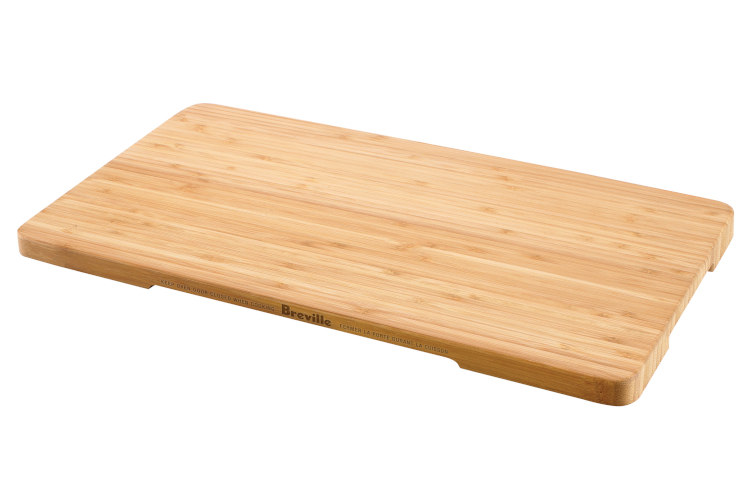 Bamboo cutting boards are ideal as they absorb very little moisture and have natural antibacterial properties. They are also harder than most cutting boards and are less prone to knife markings over time. Recessed handles on the sides make it easy to pick up and transfer directly to the table for serving. As a tray, it replaces the need for a trivet or heat mat to protect the table surface from heat damage. Breville is a maker of small kitchen appliances, founded in Sydney, Australia, in 1932. They created the original sandwich toaster, a small household appliance that makes toasted sandwiches. In 2002, the Breville brand was launched into the USA and Canada. North Americans have embraced the brand and products and today Breville is considered one of the most premium and innovative small kitchen appliance brands in these markets.